This guide is now up to date as of the 5th of March where the duration of Instability was reduced in the patch. This is the now re-written version of my Sindragosa guide. On paper, this fight looks very easy. In practice, it’s a little more tricky. The original positioning I posted didn’t work so well for us, so, as a guild, we ended up switching things around. As this fight is so very dependent on correct positioning, the post will be a little image heavy. I’ve included both screen shots from the game and some diagrams for clarification. I’d like to thank my guild master, Oshift for assisting with the modelling in this post! None other than the Frostwyrm Queen herself, Sindragosa resides in the Frostwing Halls of Icecrown Citadel. 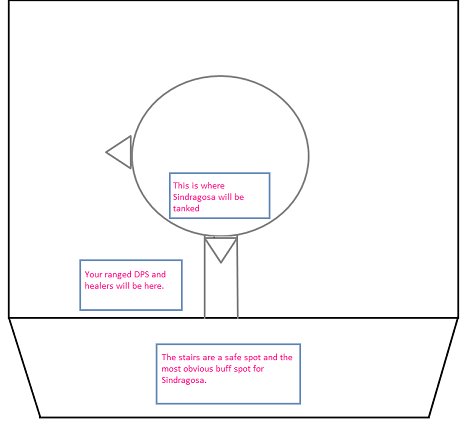 While this fight is simple enough in concept, the execution has to be rather precise or you will simply find your raid becoming overwhelmed in phase 3. In addition, the encounter requires careful debuff management to ensure DPS don’t kill themselves. The above screenshot shows Sindragosa’s room. We spent a week learning this boss and most of the problems were related to the positioning of ice tomb’s in phase three. There is little room for error without chain tombing your raid so it’s vital to get a really good feeling for her room and for the exact positioning of each phase. The positioning on this fight is all important, particularly in the stage two and stage three. For clarification, I refer to phase 1 as her pre thirty percent ground phases, phase two as her air phases and phase three as her sub thirty percent ground phase. The above image shows how we initially position Sindragosa. This encounter can be broken down into a three phase fight. The first two phases cycle until Sindragosa reaches 30% health. At this point, phase three begins. Right from phase one, it’s essential to maintain good positioning for this fight. Your healers and ranged DPS should be grouped as per the screenshot above (that is to say, with the totems). Take a mental note of this position, it’s important! The pull is quite straight forward purely because Sindragosa will agro on you when you step too far into her room. 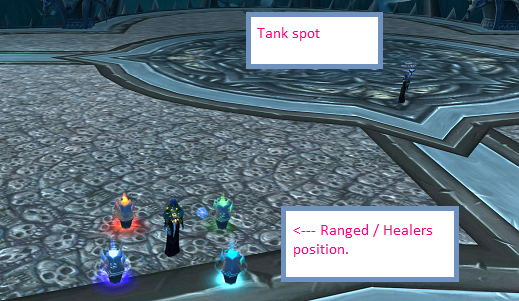 Healers and ranged DPS should move to their spot (see the image above). The tank should charge in. As Sindragosa is a pretty standard dragon, she has a front cleave and a tail swipe ability. Due to this, ensure your tank has agro before you start DPSing. Over eager DPS drawing her attention in the first few seconds can result in a cleaved raid. As a caster, there are a couple of abilities you need to be watching for in phase one. This is a raid wide damaging aura. It pulses every three seconds and you will want to be using either frost aura or, if not possible, a frost resistance totem. There is nothing you can actively do to avoid this, but as it effects you’re health, it’s worth a mention. Inflicts an arcane malediction on the target, causing any spells cast to result in a backlash of Arcane power after 8 seconds. Multiple spellcasts by the afflicted target will intensify the backlash. Using magic while afflicted with Unchained Magic will build up unstable energy, dealing 2,000 Arcane damage to the caster per spell cast, 5 seconds after spellcasting ends. Stacks 99 times. In short, Sindragosa will cast a debuff on two healers or casters called Unchained Magic. Deadly Boss Mods at least, is very clear in it’s broadcasting should you be the target of this debuff. Every time you cast, you gain one change of Unstable Energy. After 5 seconds, you will be dealt damage based on the number of charges you have collected. How many stacks of this debuff you can safely acquire depends very much on your healer setup. Eight stacks is “safe”, it won’t kill you. We run with a disc priest, a resto druid and a holy paladin. With hots and shields you can run to around ten or eleven debuffs. Some guilds will do this fight with two healers. Some won’t have disc priest shields. Play it safe with how many debuffs you can take and communicate with your healers for feedback on what is manageable for them. Stopping DPS entirely isn’t a viable option. Sindragosa has an enrage and taking her down fast in your phase ones (or ground phases) is vital to give you plenty of time in phase three. It is really vital that you can see and monitor this debuff as continued casting will kill you regardless of how good your healers are. Make sure your debuffs are set up to be clearly visible. This is cast once every ground phase (every phase one). It’s an instant cast, much like an AoE death grip. She will draw the entire raid (plus your totems quite often) towards her. You have to run away instantly as following Icy Grip is Blistering Cold. This is a 25 yard range frost based AoE that can inflict 35,000 damage. If you’re too slow at moving out after Icy Grip, the chances are high that you will die. 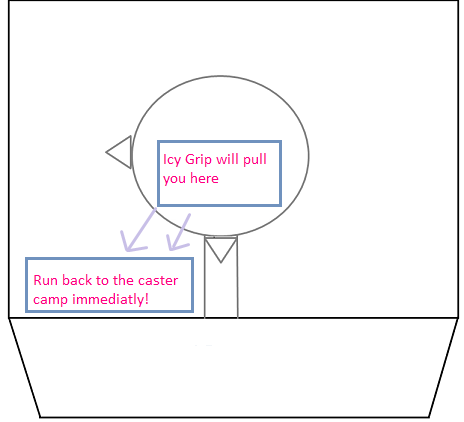 If you are using dps fire totems, use her icy grip to get your Searing Totem in range of her. Using Totem of Wrath at the start of phase one will ensure you take advantage of the glyph buff. When she pulls you close with her icy grip, drop a searing totem as you run back to range. As I briefly covered above, Sindragosa ground phases, or phase ones, are really the time you have to put out a lot of DPS. During her air phases, you can’t DPS her. At under 30%, the hits her soft enrage point and enters phase three. While she will stay grounded at this stage, you may find yourself caught up DPSing ice tombs (depending upon your raid setup). As these will take priority, DPS in phase three will be quite slow. The more time you have for phase three (that is to say, the faster you get her down before then, the better for all.) We use heroism right at the start of the pull. It will give all your DPS a few seconds to do some initial burst before the debuffs start rolling (and yes, the melee have their own DPS limiting debuff just like the casters do). Whatever you do, watch your debuffs. At 85% health and every two minutes after this, Sindragosa will lift into the air and so begins phase two. All three abilities during phase two effect you as a range DPS. These are as follows. This is an instant cast ability marking the targets for the incoming frost tombs. The targets will receive a green arrow over their heads (much like a hunter’s mark). In ten man there are two members marked for frost tombs. In twenty five man raids this is increased to five. After seven seconds, the players marked will become entombed. The targeted players are entombed in ice. Entombed players will take damage until released at the end of phase two. Ice tomb has a “splash” effect so any players stood within ten yards of marked players will also become entombed. These ice tombs provide line of sight from the next ability. Sindragosa will cast this four times per phase two. This inflicts a large amount of frost damage to any players in line of sight of the landing spot. A white, whirling spot will appear on the ground marking where the frost bomb is going to hit. The idea, quite simply, is to always keep the ice tomb between yourself and the spot marked for the bomb. Phase two is all about positioning. When phase two begins, the whole raid should move back up the stairs. The reasoning for this is simple. Frost bombs can hit just about anywhere in the room and you always have to line of sight them with the tombs. If your hold raid are back on the stairs, the frost bombs will mainly hit in her room ahead of you. This minimises movement for your raid. The above diagram shows the positioning of the frost tombs. The tombed players should be around 10 yards apart to ensure the damage doesn’t splash over. The raid should be at least ten yards behind these players before they become tombed. If you’re within range of the marked players, the tomb will splash to you, not only causing you damage but also entombing you in ice. The above screenshots should show clearly where we position the two frost tombs. As a guideline, you can see two parallel lines on the ground stretching from the base of the stairs to the central circle within which the dragon is tanked (it’s part of the floor design). Use these as an indication for where you should be standing! Once these players are entombed, the whole raid should gather around them. The whirling white marks will appear in the room and signify where the first frost bomb will be. 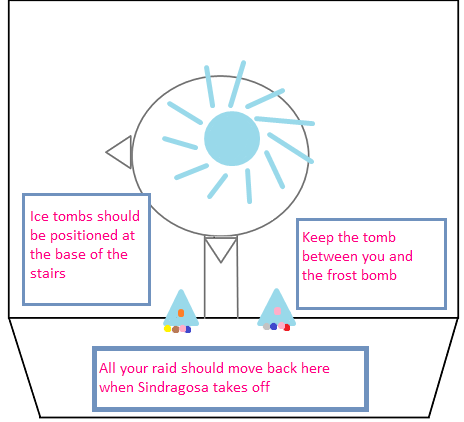 The raid should place themselves so a tomb is between them and the frost bomb thus shielding them from the damage. Be aware, the bombs can appear close to the original raid position and require you to move the full distance around your tomb. In addition to dodging the frost bombs, your players encased in the tombs must be released before Sindragosa lands again. It is imperative to control the damage on the tombs carefully. Killing them too early will mean you can not line of site the bombs and your raid will die. Killing them too late can result in the played inside dying from asphyxiation. Controlling your DPS on the tombs is vital. Once you get used to this phase and everyone has learned to recognise the incoming bombs and dodge them, you will find phase two easily managed. It is worth noting that you can still carry the casting debuff into phase 2. Keep this in mind and do not allow your stacks to build too high due to carelessly spam DPSing tombs. As a guideline, I flame shock the tombs from the start, as she places her last frost bomb, I will flame shock a second time. As soon as that bomb is over, I lava burst the tombs. Along with the melee DPS, this is more than sufficient to release your fellow guildees. Phase one and two will continue to cycle until you reduce Sindragosa to 30% health. You will then enter phase three. The same concepts from phase one and two are carried over here. She gains another ability and everything speeds up. As we transition to phase three, I will usually pop my Fire Elemental Totem. Some guilds will want heroism saving for this point so be sure you check with your raid leader what his or her preferences are. This ability will buffet all nearby players every five seconds, increasing the magical damage they take by 15% per application. If this is allowed to stack too high, the frost aura which persists into the this phase will wipe the raid. The stacks of mystic buffet are reset by line of sighting Sindragosa via the same use of frost tombs as seen before. As with phase two, players will be marked with a beacon identifying them as the next targets for ice tomb. It is vital to have a predesignated ice tomb spots for two reasons. Firstly, then need to be easily accessed by both melee and ranged. Players will need to hide behind them to reset their stacks of mystic buffet. For this reason (and for the purposes of melee DPS), the tombs need to be fast reached by both melee and range. In addition to this, the same concept applies as in phase two, if players are too close to the marked players, the tombs will spread. Multiple players tombed can wipe the raid. A healer is entombed. A healer remaining in a tomb for too long can wipe your raid. If I’m resetting my debuff stacks. 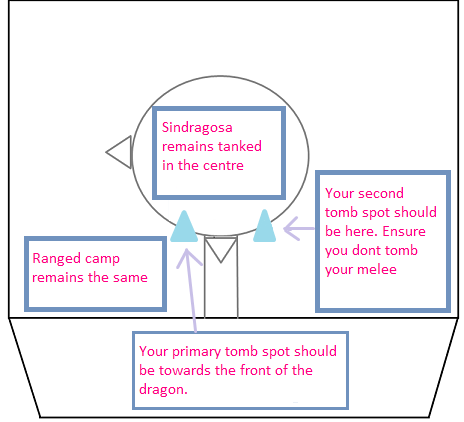 The above screenshot shows the positioning of your primary tomb spot. All tombs should be placed here. If another player gets marked for the tomb before the first has been released, then refer to the second tomb spot below. The debuffs still take a lot of managing in this phase. Along with the mystical buffet, casters will still be subject to unchained magic. You have to be very observant of your debuffs in this phase. It’s quite easy to find yourself DPSing hard to free a tombed healer while failing to notice your instability stacks building too high for you to be healed. Equally, due to mystical buffet, you want to avoid allowing your stacks to build as high as in phase one as the damage will be increased. If there is no paladin in the raid to provide frost resistance aura, you may find you have to use a frost resistance totem instead. If you are free to use fire DPS totems, use the first part of phase one to drop totem of wrath and secure your glyph buff. When Sindragosa casts her Icy Grip and pulls the raid close, drop your searing totem as you move away. This ensures it is in range to damage her. At the start of phase three, use your fire elemental for additional damage on Sindragosa while your raid are damaging the ice tombs. 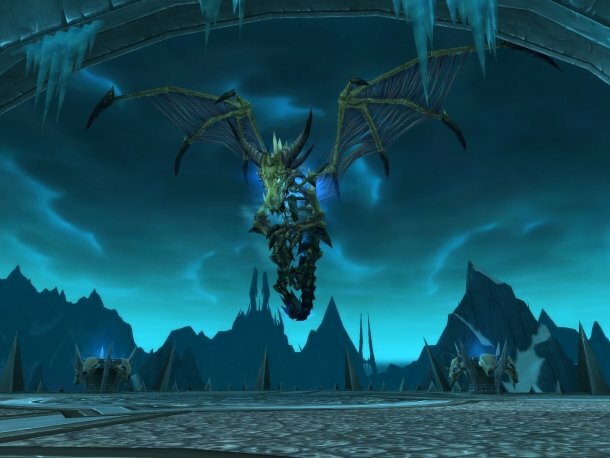 Although I mentioned this in the phase one details, please note that Sindragosa’s Icy Grip can pull your totems to the centre of the room along with your raid. You may then find you are out of range of your totems when you return to the range camp. Note:- While not strictly related to Sindragosa, a word on her trash. The first two packs are large AoE packs of whelplings. There is nothing significant about these packs (aside from the fact you can have great fun with your Magma Totem / Fire Nova combo). Following these two AoE packs are the two dragon guardians; Spinestalker and Rimefang. Spinestalker has an ability called Bellowing Roar. As the name suggests, this is an AoE fear and you’ll want to be using your tremor totem to avoid your group scattering all over the place.